Update: Cats can use this product and enter the giveaway too. There is a bone-less design at Nip and Bones that cats would probably prefer to dog bones. BOL! My pal Baby Patches has the most wonderful things in her shop - Nip and Bones. I always find furrific toys and treats at Nip and Bones. Last week, Baby Patches gave me a sneak peak at a new item she added to her shop this week. It is this pawsome personalized placemat! I insisted on being the first dog to get one from her. There are so many colors to chose from! Mom chose a beautiful (#63) Aquamarine color. Mom said it was her turn to chose the color of something. Aquas and Teals are her favorite colors. I told Mom that it was a Personalized Dog Placemat, and that MY name was going on it. It has cute paw prints and bones around the edges. The design and name are formed into the placemat. They aren't just printed on top of it, and they won't rub off. Your humans can wipe, scrub, vacuum, and sweep all they want; your name is a permanent part of your placemat! There is no mistaking whose bowls belong on it. Multi-dog families could get one for each dog. Every dog would have her own pawsonal place at mealtimes. This one says PEPPER - it is mine! 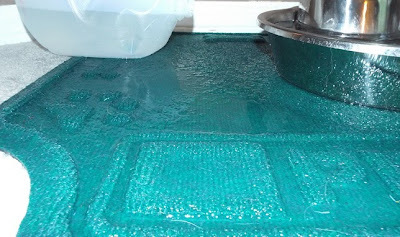 When Mom read about the dam edge part of the design that contains spills, she just had to do one of her water tests. BOL!! She filled a jug with water and dumped it over so the water just poured out in a big puddle. You can see the puddle being trapped by the raised dam edge in this photo. 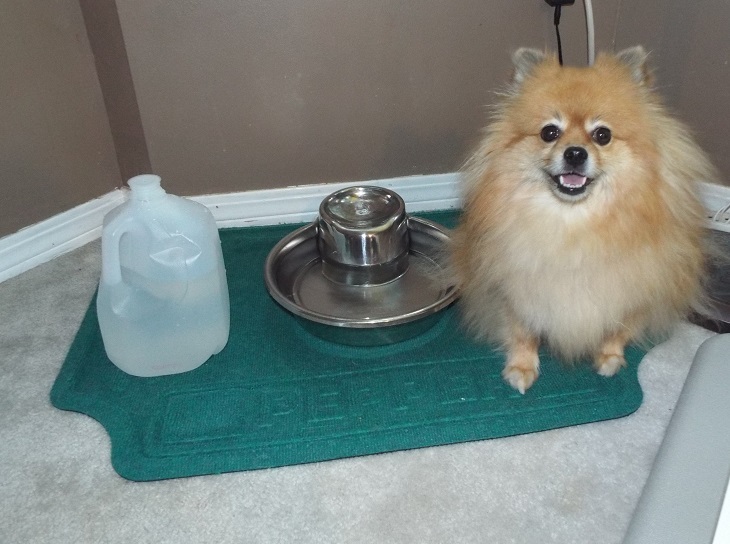 This mat will hold any mess a dog makes when eating or drinking. The top material is really absorbent. 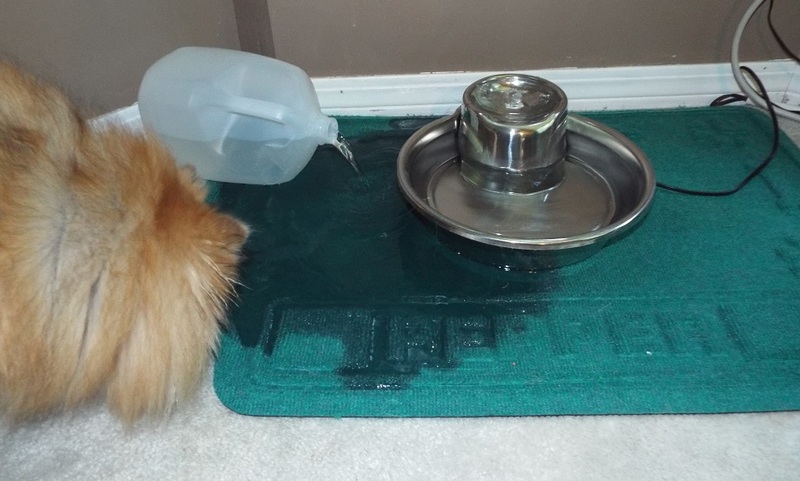 I know some dogs make a lot drool and drips when they drink, I think they really need a placemat like this one. I have heard of some dogs being re-homed because they are messy when they drink or eat. One of these placemats would have solved that issue. 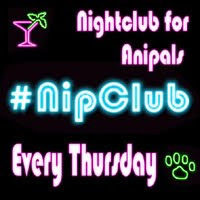 Which reminds me - Nip and Bones donates part of its sales every month to a chosen rescue group. Every time you order from Nip and Bones, you are helping an animal in need. Now - back to my review. This heavy duty placemat features a non-skin rubber backing that prevent spills from soaking through to your floor. It can protect all types of floors. Most of my house is carpet, so mine is on carpet. It is pawfect for my fountain. Mom has had some big spills/splashes when she lifts up my fountain for it's monthly filter change and motor cleaning. Mom is really the messy one, not me. BOL!!! The top material is like the carpeting in some stores. I love to roll on this type of carpet. Naturally, rolling on it was the first thing I did when Mom unpacked it and laid in on the floor. Then Baron and I thought it would make a great nap area. Once Mom put my bowl on it, I realized it was for eating - not napping. BOL!! This placemat is not tiny like the ones humans put on their tables. This durable placemat is a generous 33 x 22 inches. It is large enough for both Baron and I to lay on. This is a very high quality placemat. It is the nicest one I've ever seen. I am so happy that Nip and Bones sent one to me! Thank you Nip and Bones! Yes, you did see the word "Giveaway" in the title of this post! Do you want a Personalized Dog Placemat from Nip and Bones? Are you ready? Everyone bark "Giveaway!" 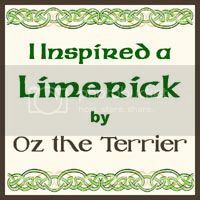 The lucky winner will get to chose the color and name (up to 10 characters) for their Personalized Dog Placemat! 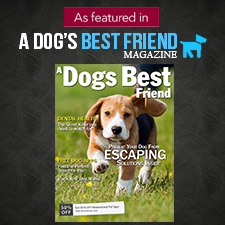 Get your paws moving and log into the Rafflecopter for entry options! Giveaway Disclaimer: I did not receive any monetary compensation for this giveaway. The company will send the prize to the giveaway winner. The opinions in this giveaway are my own and not influenced by any outsider. I am not responsible for lost prizes. I receive no additional benefits for talking about the product or company. Red, yes and its durability! I like the Khaki mat, and I'm a messy drinker. Mom always has to wipe up the mess. My favorite feature is that it is so nice looking and well made. HufflePup is the messiest drinker I have ever seen! He literally fountains water out of his mouth when he drinks like a gushing stream, AND he likes to carry mouthfuls of food away from the bowl to crunch on one kibble at a time. This mat might not help with the food thing but it'd definitely save our floors from the oodles of water! We love one in blue or gray. Do they make them for cats, too? We need one like that under our fountain. EK plays with the water and gets it everywhere! 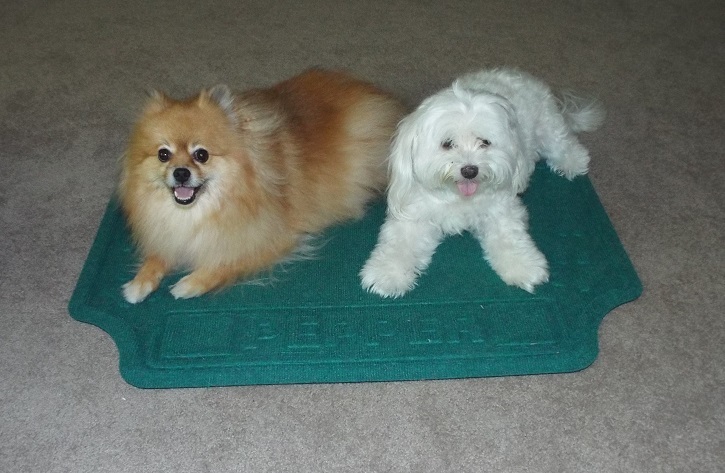 Those look like pawsome mats, Pepper! If we win one, we'll have to buy another, BOL!!! I'd pick purple! I'm not messy with meals, but sometimes I'll roll my basketball into my water bowl and spill it. BOL!!! That sounds like a fun game! Although I suppose your human might think otherwise. BOL!! 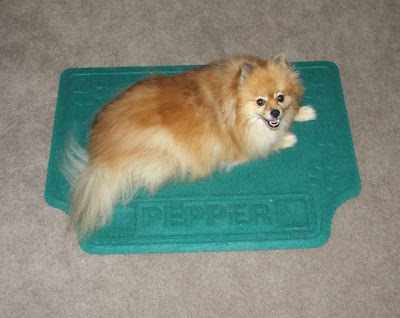 My favorite feature of this mat is the top material and it's so cute, especially personalized! 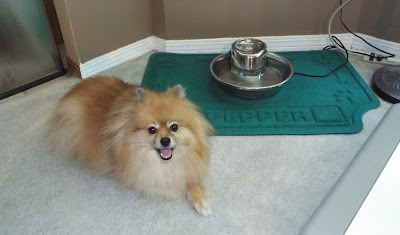 I want to win a personalized place mat what an excellent blog Pepper. Aqua would be fine with me. That is the perfect color for you, Pepper! I love how you share it with Baron and I also loved Mom's spill test. I need one of those for myself, same color. I am such a messy eater. I like to eat directly from the placemat, so this would be wonderful for me. Nice job on the educational review! What an awesome product Pepper! Shiner is not really a messy eater... she cleans up her messes pretty well hehe. BUT I do have an issue with my baby knocking her water over or deciding that she wants to go and splash in the bowl. So, I think that one of these would probably help with that. Oh and PS - we'd probably choose a purple or pink! BOL!!! This mat would be pawfect for Shiner's splashy days. We use the mini 'office water cooler' design that they make for pets. But we have a cat named Mitzy too. 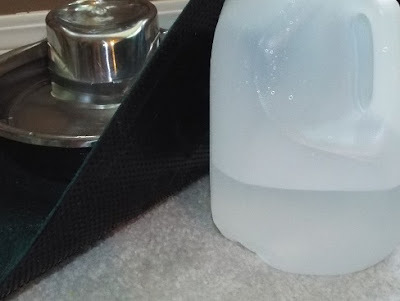 Every night when the warden(me) goes to sleep she plays with one of the jugs until at least half of the jug's water runs off it's useless place mat and all over the hardwood floor. Every single day I have to do my best to dry out the floor. The wood is turning green! 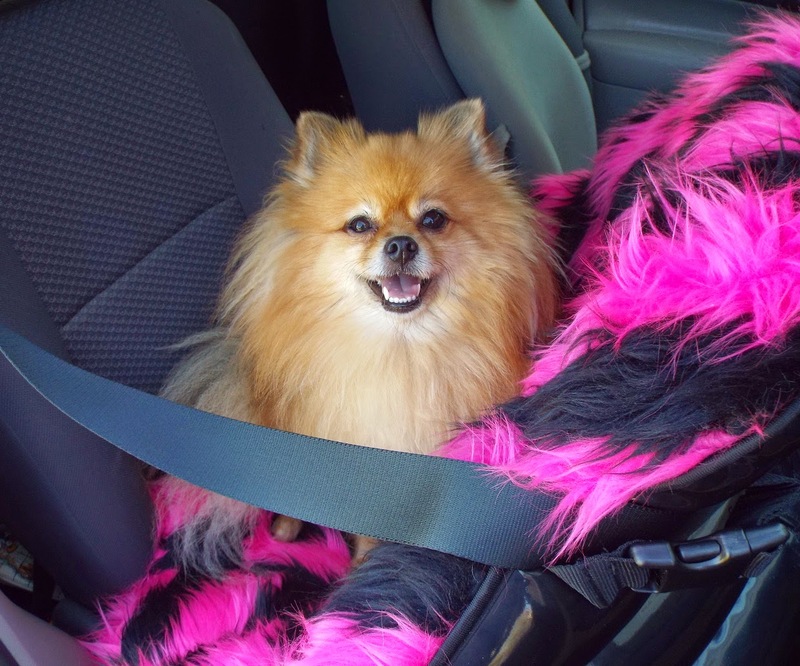 At one time Mitzy was even featured on the web site 'S*** My Pets Ruined' for one of her other escapades. Yipes, that is one messy Mitzy! How large is the water cooler jug? I ask because every item has its limits. This one can hold a lot of water, but I wouldn't expect it to hold more than a half gallon. Once you reach the maximum absorption amount, there can be overflow of the dam edge, or some wicking action along the edges. I based my expectations/evaluation on normal bowl capacities. At least less water would reach your floor though. Oh, shoot, you have word verification on. We can't read it so we probably won't be able to leave a comment. Please, please, please, consider turning it off for your visitors! I am sorry about the word verification, but every time I turn it off - I am slammed with spam comments. Many of the spam comments are explicit, and I don't want my younger readers exposed to such things. The only other option is to moderate every single comment, and that would have many readers thinking their comments didn't go through. I do wish I had a better option than the word verification. I find it annoying too. BOL!! I like the raised edges. The one we have currently doesn't have that so the water gets underneath and molds. I like the medium blue one because it matches my kitchen decor. OMD! This would look so furtastic in the Bordeaux color! That "dam edge" sounds like it would be wonderful to prevent "Vlad-Beard-Water-Damage" no matter where you put it! You wouldn't believe how much water goes on the floor when he's in a lay-down-and-wallow-in-it mood. We've tried other mats, but they didn't do what your mom shows it doing in the spill-photo, Pep. Considering the cleanup-work it would help save, one of Vlad's names "Bodgan" would fit perfectly. It means "Gift from God"
I would pick blue since I have a male dog, Gummybear. I like how it has no puddles when water is spilled! Purple. Tulips pretty good on getting any straw kibble, sometimes drips a little with the water. I can't believe ANYONE would get rid of someone because they eat messily! Some people are RIDICULOUS and don't deserve to exist! We didn't win the mat, but through Pepper's excellent demonstrations, we are going to buy one anyway from Nip & Bones.